International recognition for Founder and Chair of Cass Centre for Shipping, Trade and Finance. 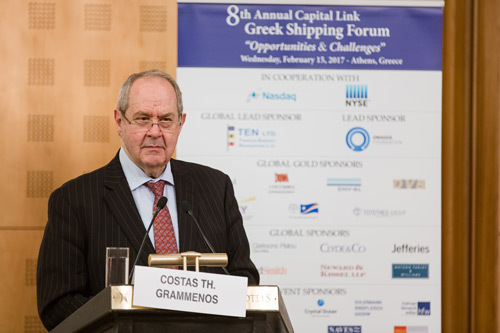 Professor Costas Th Grammenos CBE DSc has been awarded the 2017 Capital Link Greek Shipping Leadership Award at the 8th Annual Capital Link Greek Shipping Forum in Athens. It is an important honour for Professor Grammenos, who, as the founder and Chairman of the Centre for Shipping Trade and Finance at Cass Business School, is a leading global authority on shipping, trade and finance. The Award is a recognition of Professor Grammenos’ unique contribution to the global shipping industry over 40 years. During this time he has shared his scientific and academic thought leadership by founding the internationally renowned Centre for Shipping, Trade and Finance. Established by Professor Grammenos in 1983 and renamed in honour of its founder in April 2007, the Centre pioneers postgraduate studies in Shipping, Trade and Finance and Energy, Trade and Finance and offers the first specialist MSc degrees in these disciplines. Through its unique blend of theory and practice, it has gained international recognition among industry leaders, policy-makers, government and academics. 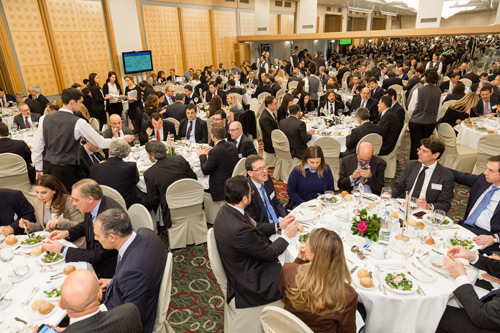 The Centre has a network of 4,700 alumni across the world, many of whom were present at the ceremony, amongst the 1400 Forum delegates, to see Professor Grammenos receive his award. Speaking at the ceremony, Professor Grammenos reflected on his long and distinguished career to date and shared insights about what he has learned along the way. He spoke about his early career at the National Bank of Greece, where he began his research on Bank Shipping Finance and his first book ‘Bank Finance for Ship Purchase’, which was published by the University of Wales Press and became its flagship publication. “I am hugely honoured to receive this award and I thank Capital Link and its President, Nikolas Bornozis. “I strongly believe in the need of combined efforts and teamwork. When my students ask me for the recipe of success I invariably reply that this recipe has three levels: The first one is hard work; the second one is hard work and the third one is hard work. “We teach students knowledge, new techniques and their application in business. We give them tools for analysis which will become tools for their success. Our job is to academically strengthen our students, to show them how they can apply theory into practice; to show them ways of thinking; of taking decisions; of taking action; to make them to think for the path of professional success in the tough, small and great world of international business networks. Professor Grammenos also took the opportunity to thank his colleagues, friends, students, alumni and family for their support throughout his career. Professor Marianne Lewis, Dean, Cass Business School said she was delighted to hear about Professor Grammenos’ award. The award was presented by Nikolas Bornozis, President, Capital Link. 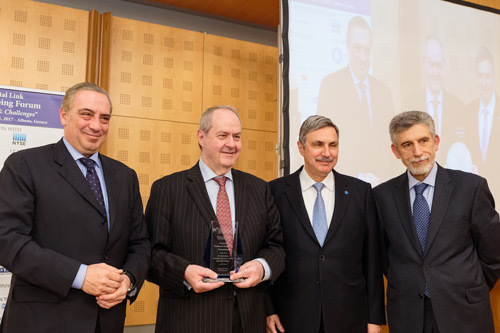 Professor Grammenos was introduced at the ceremony by Dr Anthony Papadimitriou, President to the Board of Directors of Alexander S. Onassis Foundation and Dr Nikolas Tsakos, President & CEO, Tsakos Energy Navigation; Chairman, Intertanko. “I am particularly glad that Costas Grammenos, a worldwide reference for the economy and the shipping industry, is a member of the Onassis Foundation and also a great friend. Thanks to him, his vision and his character, thousands of young Greeks and non-Greeks expanded their horizons by learning to sail not only in quiet but also in difficult times. “I will always admire Costas Grammenos not only for his expertise but also for his broader culture, as besides being a wonderful teacher, an exceptional character and a friend, Professor Costas Grammenos is a true “Homo Universalis”. Theatre, music and literature are practically integrated in his personality. His education, allows him to combine in the same sentence both shipping and Aristophanes, proving the value of an open spirit in an extremely important and successful life journey." “On my many and long journeys as a businessman and with my Intertanko hat on, I meet Professor Grammenos' former students in top positions all over the world, amongst whom there is a strong feeling of solidarity, camaraderie and networking. But it is not only the level of education and networking possibilities that the Professor oversees, it's his amazing ability to remember every single one of the more than 4,000 students that he has taught. The Professor not only cares about the one or two years you spend on his course, but he considers every one of his graduates to be like family. With this, I want to congratulate Capital Link for their choice and say a big thank you to the Professor, on behalf of all shipping people, for his contribution to our industry's profile." Find out more about studying at the Cass Centre for Shipping Trade and Finance here.